Peacefield, the Adams' "Old House"
Home to two US presidents and First Ladies, and their distinguished offspring, from 1788 to 1927. John Adams (1735-1826), first Vice-President of the United States, and second President of the United States (1797-1801), bought this 40-acre (16-hectare) property in Quincy, Massachusetts (map) in 1787 while still resident in London. Returning to Quincy in 1788, he and his wife Abigail Smith Adams (1744-1818) moved into what was a then very simple—primitive—residence dating from 1731. They set about improving both its architecture and its comforts. After his election defeat by Thomas Jefferson in 1800, the Adamses moved from Philadelphia and returned to the "Old House," which they named Peacefield. Their son John Quincy Adams (1767-1848), diplomat and sixth president of the United States, lived here as well, later with his wife, First Lady Louisa Catherine Adams. They were followed in residency at Peacefield by other distinguished members of the Adams family, including Charles Francis Adams, United States Minister (ambassador) to Great Britain during the American Civil War; and literary men Henry Adams (as in The Education of Henry Adams) and Brooks Adams. The house was occupied by the Adams family until 1927. In 1946 it was donated by the family to the US National Park Service as a historical site. The Stone Library (1873) next to the Old House has the Adams' collection of 14,000 books. 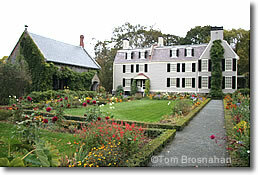 "Peacefield," the "Old House" of John Adams and Abigail Adams in Quincy MA.